The new Ford Escape is again being recognized as a popular crossover packed with exciting technology and safety features. Explore the model highlights of the entire 2018 Ford Escape lineup today when you visit our Ford sales center! 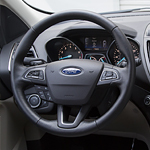 Get the Ford Escape up to speed on the highway and the Blind Spot Information System is going to scan around the car for any other vehicles getting too close. If a car moves into the blind spot of the Ford Escape, the side mirror flashes a warning to take action and avoid getting into a collision. The Forward Collision Warning with Brake Support in the Ford Escape is going to help protect you from anything in front of your vehicle that could result in a crash. If anything is detecting moving slower than your vehicle the braking system slows down your vehicle to avoid contact, then resumes speed after the coast is now clear. Take the all-new Ford Escape for a test drive when you come by and visit us at Sheehy Ford of Warrenton today.